Ancient coins and by extension the term Numismatics refer to the study and collection of currency, coins, monetary tokens and similar objects used in an exchange of goods or services since ancient times. 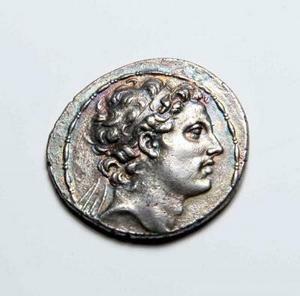 Although most common ancient coin collectibles consist of groups of Ancient Greek coins or Roman coins and of course ancient Chinese or Asian coins, this genre also includes coinage and related items from other eras, most notably Medieval times and often more recent currencies that have now become extinct, either because they have been replaced by a new system (e.g. countries in the Euro Zone) or from countries that no longer exist. Special limited issues of minted coins or printed currency also appeared at times of war or political & financial turmoil. For example, many European countries experienced unprecedented levels of inflation during WWII and were forced to print paper money of extremely high face value in terms of units, yet worth only a small fraction of what they would be valued in previous years. Similarly, there were several times in the history of a nation that an occupying power would issue and circulate new currencies or coinage to replace or supplement the local monetary system. Although often relatively recent, these temporary issues are frequently as rare and valuable as some much older ancient coins. In fact, most ancient Greek or Roman coins are not as valuable as some people may think, and their age, regardless of condition, does not necessarily mean that they are worth a lot at auction. The reason is that many of these were minted in large numbers and over long periods of time. In contrast, the most collectible ancient coins are those of smaller colonies of Greece or Rome, which were circulated in relatively small quantities and accumulated by only a few successful merchants or the noble class. The more remotely a colony was located, the less trade existed and fewer coins were minted. Similarly, the shorter a period during which a certain coinage was minted, for example in cases when a ruler or dynasty lasted for only a few years, the more valuable they have now become. In other words and to put it succinctly, the worth of ancient or even more recent collectible currencies & coins, depends mostly on the number and frequency that these were issued. Other factors include Precious Metal content, historical significance, and of course condition. Each form has its own characteristic elements of attraction, for example some are exceptionally made with a strong artistic flair and appeal to collectors of Metalware, especially if made using Precious Metals, such as Gold or Silver coins. Others reflect a historical period of significance, especially if very brief, that appeals to history buffs. But most importantly, the vast majority of ancient coins or related collectibles usually appreciate in value consistently with time since they will never be made again. A word or caution and as many seasoned collectors will attest, there are thousands upon thousands of fakes and recent copies, many aged appropriately and artificially to pass as ancient, but are worth less than the metal they were coined with or paper they were printed upon. If you are new collector of ancient coins, it is important to educate yourself with related guides and new information all the time. There are also numerous Test Kits that can assist in determining their true metal composition. Our Antiques Pricing Guides contain numerous records of ancient or later coins & currency sold at auction, which will help you evaluate your collection and determine current market trends. Some examples are shown below. EIGHT ANCIENT COINS. Most are probably Roman, one is possibly Cyrian. Copyrighted Material - All rights reserved.